November 15, 2018, 4:10 p.m.
Theresa May has successfully agreed a Brexit deal with EU negotiators, but she has seemingly failed to convince Cabinet of its merits: Brexit Secretary Dominic Raab, Work and Pensions Secretary Esther McVey and junior Brexit minister Suella Braverman all resigned soon after details emerged. The PM then spent almost three hours today defending the 500-page document to Parliament, as backbench brexiteer Jacob Rees-Mogg called for a vote of no confidence. Has the agreement gone down more favourably with the UK public? In short, no. 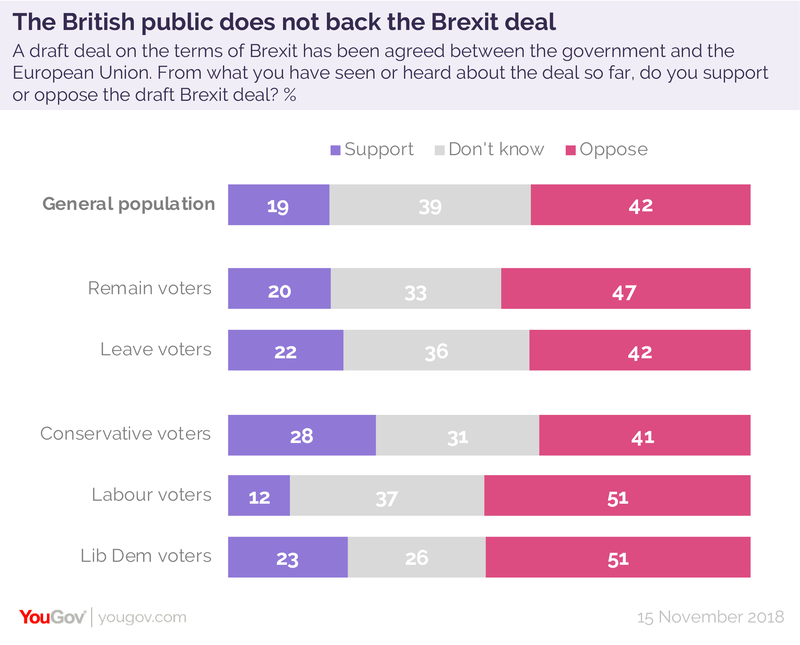 A rapid turnaround YouGov study conducted today shows that the British public are more opposed to May’s Brexit deal than they are supportive. Four in ten Brits (42%) oppose it, based on what they have seen and heard so far, compared to only 19% who are in favour. A further 39% answered “don’t know”. Remain and Leave voters are roughly united in their opinion of the deal. Four in ten Leave voters (42%) oppose it, as do almost half (47%) of Remain voters. By contrast, only 22% and 20% respectively support the deal. The Prime Minister has failed to carry her own party - 41% of 2017 Conservative voters have an unfavourable view of the proposed arrangement, compared to 28% who support it. 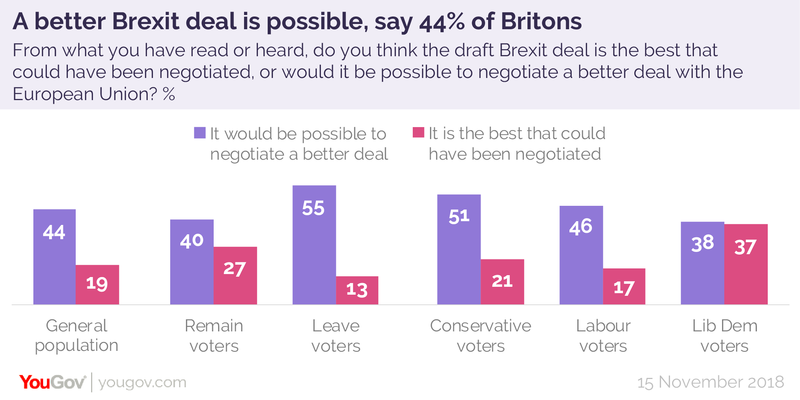 This is not simply opposition for opposition’s sake: many Brits think that it would have been possible to strike a better deal. Four in ten Brits (44%) think that the UK could have squeezed more favourable terms out of the EU - only 19% think that what she has presented to the nation is the best Brexit agreement possible. Leave voters have higher expectations than Remainers - 55% of those who backed Brexit in 2016 think that a better deal is possible, compared to 40% of Remain voters.